How do racialized migrant mothers contest hegemonic racialized formations of citizenship? Bringing together leading scholars from international and multi-disciplinary perspectives, this book shows how migrant mothers realise and problematise their role in bringing up future citizens in modern societies, increasingly characterised by racial, ethnic, religious, cultural and social diversity. 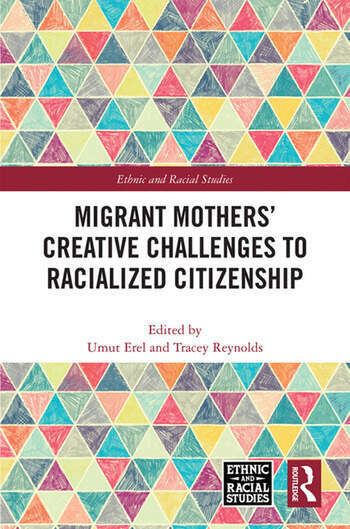 The book stimulates critical thinking on how migrant mothers creatively intervene into citizenship by reworking its racialized meanings and creating new, racially plural practices and challenging boundaries. The contributions explore the processes that shape migrant mothers’ cultural and caring work in enabling their children to occupy a place as future citizens despite and against their racialized subordination. The book contributes to disciplinary fields of politics, sociology, anthropology, psychoanalysis, participatory arts practice and theory, geography, queer and gender studies, looking at the thematic areas of participatory arts, family forms, social activism, and education in the US, Canada, the UK, France, Portugal. These cross-cultural and disciplinary perspectives contribute to the exciting emergence of a distinctive field of research engaging with pressing intellectual and social issues of how ideas and practices of citizenship develop in the face of increasing spatial mobility and across boundaries of generation and ethnicity, in the process requiring new, creative interventions into how we think about and do citizenship. This book was originally published as a special issue of Ethnic and Racial Studies. Umut Erel is Senior Lecturer in Sociology at the Open University, UK. Her research interests are in gender, migration, and racism, and how these articulate with citizenship. She is also interested in participatory, collaborative and creative methods for research and engagement. Tracey Reynolds is Professor of Social Sciences at the University of Greenwich, UK. She has conducted extensive empirical research in the UK across a range of social issues including black minority ethnic and migrant families living in disadvantaged communities.